Titusville City Hall is located at 555 South Washington Avenue, Titusville FL 32796; phone: 321-383-5802. Photo: Wager House, ca. 1891, 621 Indian River Avenue, Titusville, FL. Listed on the National Register of Historic Places in 1990. Photographed by User:FI295 (own work), 2011, [cc0-by-1.0 (creativecommons.org/publicdomain/zero/1.0/deed.en], via Wikimedia Commons, accessed September, 2014. The Titusville Multiple Property Group was listed on the National Register of Historic Places in 1990. Text below was adapted from a copy of the original nomination document. Adaptation copyright © 2011, The Gombach Group. The City of Titusville is located in Brevard County, Florida, approximately 40 miles east of Orlando and 46 miles south of Daytona Beach. It is situated beside the Indian River, a salt water lagoon stretching along the Florida East Coast some 100 miles from southern Volusia County to northern Martin County. The corporate limits of Titusville cover 16 square miles along the Indian River. Since 1879 Titusville has served as the seat of county government. Titusville, named for early settler Colonel Henry T. Titus, is the second largest city in the county, with a population of 37,981. Brevard County, originally named St. Lucie County when it was established March 14, 1844, was renamed in 1855 for Judge Theodore Washington Brevard, a North Carolinian who served as Comptroller of Florida from 1853-1861. In 1879, the county annexed the southern portion of Volusia County which included Titusville making it one of the longest counties in Florida, stretching some 75 miles along the Atlantic Coast and the Indian River. Titusville has an extended period of pre-historic occupation and historic development. The evidence of human occupation of the area ranges from the Indian burials at Windover (listed in the National Register 1987) dating from 6,000 B.C., to the sites associated with the development of the space industry at Cape Canaveral during the 1950s, 1960s, and 1970s. Windover, discovered in 1982, is one of the best preserved aboriginal burial sites yet discovered and has yielded more than 40 skeletons of men, women, and children approximately 8,000 years old. Among the remains are some of the oldest, most intact brain tissue ever found. American settlement of the Titusville area did not begin until after the Civil War. In 1867, the founder of Titusville, Colonel Henry T. Titus, arrived at a site known as Sand Point, later to be named Titusville. Titus, born at Trenton, New Jersey on February 13, 1822, became well known as a filibuster who supported Cuban rebels in their fight against Spanish colonialists. He was accused and tried for violating U.S. neutrality laws, but was exonerated. He later moved to Jacksonville, where he became a merchant. During his residence in Jacksonville, Titus met and married Mary Hopkins, the daughter of General Edward Stephen Hopkins. In 1856, he moved to Kansas where, despite his northern origin, he supported the pro-slavery cause. He was involved in fighting and captured by abolitionist forces. After his release in a prisoner exchange, he left Kansas, carrying with him the nickname "Border Ruffian." In 1856, he commanded troops in Nicaragua under the regime of William Walker, an American expatriate who had seized control of the country. Following Walker's overthrow, Titus fled to San Francisco. During the Civil War, he surfaced as a blockade runner on the Indian River in Florida, where he was captured by Union forces. After the war, he remained an irreconcilable supporter of the South. In 1866, he returned to the Indian River, reportedly for health reasons. At the time of his arrival there were only a few families in the area: the Stones at Sebastian, Captain Miles C. Burnham at Canaveral, and the Dummetts at Merritt Island. Titus and several New York investors established the New York and Indian River Preserving Company for shipping Florida seafood to northern markets. The company established operations along the Indian River, where its employees proceeded to harvest fish, turtles, and oysters. The seafood was then to be cleaned, boiled, canned, and shipped to New York. As a result of shipping and canning problems, the venture failed the year it started. Titus stayed at Sand Point on a piece of land owned by his wife. He conceived the idea of founding a town and opening up the Indian River country to other settlers and adventurers. He established a stage line between Enterprise, a river port on the upper St. Johns River, and the new settlement. Titus operated a mercantile store at Enterprise and a dry goods store together with J. W. Joyner at Sand Point, the only store along the coast of Volusia and Brevard Counties. In 1870, he completed the Titus House, a local hotel. The Titus House became the community center of the fledgling settlement and the surrounding Indian River region. It was a wood frame building with a large central block and two long wings, all rising one story in height and surrounded by verandas. It was located on present day Washington Avenue, just south of Main Street. At the hotel, Titus served many of the exotic game, fish, fruits, and vegetables which abounded in the Indian River region. He paid for the clearing of land for the new town and the laying out of many of the first buildings. Titus helped establish a mail route to Sand Point (Titusville) and served as postmaster and as justice of the peace. He shipped freight into Sand Point by boat and wagon and then filled them with citrus and pineapples for re-shipment north. In 1873, the name of the post office was changed from Sand Point to Titusville. According to one account, the name resulted from the outcome of a domino game between a Captain Rice and Colonel Titus. The winner of the game was Colonel Titus and thus the town thereafter became Titusville. In contrast, other sources indicate Titus was postmaster and unilaterally named the town for himself despite some local opposition. During the 1870s, the town grew at a brisk pace with 200 residents by 1880. In 1879, it, together with the southern part of Volusia County had been annexed to create Brevard County. Colonel Titus pushed for the location of the county seat of the new county to be at Titusville. County voters overwhelmingly chose Titusville over Eau Gallie or Rockledge. Colonel Titus donated land with the covenant that it only be used for county buildings. Two years after the election, Henry Titus died at his residence in the town which he had founded. The establishment of Titusville as the seat of government for Brevard County exemplifies the maturing character of the community. In 1879, Captain J. Francis LeBaron laid out Joynerville, the first area platted within the present corporate limits of Titusville. LeBaron was a civil engineer and at one time served as chief of the Army Corps of Engineers. He is credited with discovering the first phosphate deposits in Florida while surveying the Peace River in 1881 for a possible cross-Florida canal route. He surveyed and laid out many towns and subdivisions throughout Florida. The new "subdivision" was originally owned by Mary M. Carlin and was probably named for J. W. Joyner, Henry Titus's business partner. Joynerville contained a number of buildings including the offices of J. Francis LeBaron, J. W. Joyner's saloon, Wager's grocery, C. R. Carlin's boatworks, and several residences, among them that of Mary Carlin. By 1880, with Titusville growing at a steady pace, the Board of County Commissioners met to discuss the building needs of the town. The Board let a contract for the construction of the Brevard County Jail. In addition, with the original courthouse still housed in a building rented from Henry Titus, the Board published a legal notice soliciting bids for the construction of the courthouse. Construction was begun in 1881 and completed the following year. The county school board was also organized in 1881, and S. W. Harmon began publication of Titusville's first newspaper. Also in 1880, J. Francis LeBaron platted a subdivision known as the Original Town of Titusville. Within the subdivision were the Titus House and Lund's Hotel, the two rooming establishments in the fledgling community, the post office, wharfs, a sawmill and several residential structures. The platting of this second section of Titusville gave some uniformity to the haphazard growth patterns Titusville had been experiencing up to this point. By 1885, the town had a population totalling 250. That same year, George Webster Scobie settled there and established the first successful commercial fish business. Titusville, although the county seat, remained unincorporated until 1886. In November of that year, local residents (men only) voted 58 to 2 in favor of incorporation. On the same ballot they elected D. L. Gaulden, Mayor; John Dixon, town clerk and treasurer; and O. T. Rice, marshall and tax collector. As an indication of the changing character of the town, Rice defeated Howell Titus, son of Henry Titus. City hall was housed in a rented building on Main Street. Despite this modest growth, an inadequate system of transportation continued to be a major impediment to the development of Titusville. It was accessible by steamer and by stage, which ran three times a week. In 1885, a trip from Jacksonville took a circuitous route as a fairly large steamboat could be taken from there to Sanford. From Sanford there were two routes to the Indian River; one was primarily used for freight and the second for passengers and mail. The first involved the transfer to a smaller steamboat on the upper St. Johns to a place called Salt Lake and overland from there to Titusville. The second route, beginning at Enterprise, just east of Sanford, covered approximately 42 miles to Titusville by horse or wagon. Until the arrival of the railroad, these routes were the chief links between Titusville and the outside world. A pivotal event in the history of Titusville occurred in 1885. That year, the Atlantic Coast, St. Johns, and Indian River Railroad began a spur line from Enterprise to Titusville. Shortly thereafter, the line was leased to the Jacksonville, Tampa, and Key West Railroad which completed the track to Titusville. Residents of Titusville contributed $30,000.00 plus the right-of-way to the railroad company to ensure the success of the venture. The transportation infrastructure of the town was supplemented by the construction of a railroad wharf at the Indian River. The wharf was a transfer point where freight and passengers boarded the Indian River steamers for points farther south. Steamship companies coordinated their schedules with those of the railroad to insure continuity of travel. Titusville residents greeted the arrival of the railroad with great fanfare. Whistles, shouts, and cheers filled the air as a single event forever changed the character of the town. The railroad had an immediate impact on the economy of Titusville and the entire Indian River region. It allowed the rapid entry of tourists and permanent settlers, while facilitating the shipment of products from the region, particularly fish and fruit, to markets to the north. Businesses directly and indirectly associated with the fish and fruit industry, such as ice plants, packing houses, and canneries developed. In 1886 D. S. Hutchison purchased the Titus House, remodeled it, and renamed it the Indian River Hotel . The population grew following the arrival of the railroad and the town became more active. Titusville soon had five general or specialty stores, express and telegraph offices, two hotels, two public schools, and a steam saw mill. With the only rail connection in the area, it was the hub of transportation for the Indian River region. There was steamer service to Melbourne to the north and other points on the river. Titusville, however, remained very much a frontier town. In 1886, one new arrival described the town as "a city of saloons" with "no churches." The frontier atmosphere of the town was soon tempered with the organization and construction of two churches that year. The first was the Presbyterian church which has subsequently been destroyed. The second was St. Gabriel's Episcopal Church which still stands and was listed in the National Register of Historic Places in 1972. In 1889, two additional churches were constructed. They were the First Methodist and St. Theresa Roman Catholic Church. The First Baptist Church was organized that same year and a building drive begun. One of the most important economic developments of the late 1880s was the arrival of Thomas Nevins, the founder of the Nevins Fruit Company. The Nevins Fruit Company was formally organized in 1898 and is one of the oldest continuously operated citrus business in the Indian River growing area, eventually being purchased by the Parrish family. The development of Titusville continued in the early 1890s. One of the most important community improvements was the addition of electric power. In the fall of 1890, the town council voted to adopt the Edison lighting system. The system was placed in operation in April of the following year. The addition of electric power resulting in the opening of the town's first commercial ice plant. The ice plant was essential to the preservation of fish products, fruits, and vegetables that formed the backbone of the Indian River economy. W. T. Whetmore operated the original ice plant, called the Crystal Ice Company. Another significant development of the early 1890s was the extension of the Jacksonville, St. Augustine, and Indian River Railway, owned by Henry Flagler, to Titusville. The new rail connection served as a catalyst for the growth of the economy and population of the town. Flagler visited St. Augustine in 1885 and envisioned the Ancient City becoming the winter Newport, a resort center for wealthy northerners. In 1889 he purchased the St. Johns and Halifax Railroad, changed it to a standard gauge, and offered improved passenger service between Jacksonville and St. Augustine. Flagler had ambitious plans for the east coast and, in 1892, extended the railroad to Daytona Beach. Later that year he began construction of the line to the Indian River region with train service beginning in January, 1893 to Titusville and Cocoa Beach. In 1895, Flagler changed the name of the railroad to the Florida East Coast Railway. The FEC quickly supplanted the steamboat as the principal means of transportation along the Indian River. Until completion of the Dixie Highway and America's adoption of the automobile for long distance trips several decades later Flagler's line was the principal means of transporting freight and passengers to and from Titusville. Despite these improvements to the town's utilities and transportation systems, Titusville suffered two severe economic setbacks during the mid-1890s. The first was the "Great Freeze" of the winter of 1894-1895. Other severe freezes had been recorded in Florida in 1835 and 1886. But the 1894-1895 freeze effectively brought an end to the citrus industry in North Florida. During the last days of December, 1894, a blast of arctic air entered Florida and pushed temperatures lower than had been previously recorded. In Titusville the temperature dropped as low as 18 degrees and barely rose above freezing during the next twenty-four hours. Although the Indian River region suffered less than points north, growers nonetheless lost virtually all fruit that had not already been harvested. Although much fruit was lost, tree damage was relatively slight during the December freeze. The plight of the railroads and shippers was, however, even graver than that of the growers. Hundreds of cars and boats would be left idle for a lack of fruit, and thousands of men, those whose jobs it had been to buy, sell, and haul, or to operate the boats and railroads, were out of work. Nevertheless, there was a certain amount of optimism among those dependent on the citrus industry because tree damage was not severe. In fact, following the freeze, a warming trend began and budding was in evidence in many groves. The worst, however, was yet to come. In February, 1895, communities throughout the state experienced new, record low temperatures. The second freeze destroyed what little fruit was left. The orange trees, during the few weeks of unseasonably warm weather between the freezes, were budding, blooming, and full of sap. Trees in North Florida were nearly all killed, and even those in the Indian River region were substantially damaged. The freeze caused severe hardship and forced many individuals involved in the citrus industry to seek new occupations. Despite this short term disaster, many growers recovered and the Indian River area became the best known citrus producing region in Florida as the North Florida citrus industry was virtually wiped out. With the commercial citrus industry in North Florida decimated, many growers from that region moved to the Indian River. By 1900, Brevard had become one of the leading citrus producing counties in Florida. Much of the production and processing was centered around Titusville. The "Great Freeze" was not the only calamity which struck Titusville during the mid-1890s. In December, 1895, the major portion of Titusville's central business core was destroyed by fire. The business district was concentrated between Broad and Julia Streets on Washington Avenue. As was true in virtually every pioneer town in Florida, the first commercial buildings were almost all wood frame, constructed of extremely flammable pine known as "lighter pine." As a result of these early building practices, fires were common, particularly in commercial areas where buildings were sited in closed proximity to each other. While a great personal loss to the merchants of Titusville, the fire resulted in improved materials and construction such as brick and hollow clay tile. The greatest losses in the fire were sustained by Mrs. M. E. Titus who owned four buildings, and Captain T. W. Lund who owned the Lund House hotel and several additional buildings. By 1900 Titusville was a maturing community. Its population had grown to 900 and its business district was being rebuilt. Its economic character had been formed. It was the seat of government for Brevard County and a transportation center and distribution point for Indian River fruit, vegetables, and marine products. Over the next several decades the population and economy of Titusville continued to grow and the quality of life to improve. In 1900, the Progressive Culture Club, the predecessor of the Titusville Woman's Club, was formed. Among the club's first projects was the development of a local library. The town's first licensed pharmacist, Dr. J. C. Spell opened the Banner Drug Store in 1907. Many important buildings were erected during the period such as the current courthouse, constructed in 1912. Other buildings constructed that year were the Spell Building and the Duren Building. Education improvements were also made and, in 1916, the Titusville Elementary and High School was completed. Transportation played an important role in the development of Titusville during the second decade of the twentieth century. One of the most important roads constructed was the Dixie Highway. The most pervasive change in the physical landscape of America's city was wrought by the automobile as cities like Titusville had to cope with demands for improved streets and the need for regulating use of the machines. By the 1920s, the automobile had begun to exert social changes as well, providing vehicular access to a different class of tourists than Florida had previously attracted. During the 1920s, as the state entered its "Boom" era, America's middle class had discovered the pleasures of Florida's climate and beaches. To accommodate travelers, construction of the Dixie highway was undertaken. As was true with the railroad, settlement and economic development followed it and other roadways which were built in and around Titusville during the 1910s and 1920s. Perhaps the most significant change resulting from road construction was the addition of trucking as a means for transporting fruit and other agricultural products grown in the Indian River region. During the 1920s, Titusville along with communities throughout the country, entered a period of rapid, abundant growth. The general prosperity of the period stimulated growth throughout the state that led to the Florida Land Boom. The Boom had its genesis in South Florida, particularly in Miami. Buildings designed in the Mediterranean Revival style by architects such as Addison Mizner in Palm Beach County, and subdivisions such as Coral Gables in Dade County, became models for real estate developments around the state, including Titusville. The stylistic models for the architecture of the period were typically Neo-Classical Revival, Spanish Colonial Revival, Mediterranean Revival, or an eclectic mixture. These styles are commonly found among the masonry and frame vernacular buildings constructed in Titusville during the 1920s. The building boom of the 1920s meant the development of areas of Titusville beyond the traditional center of town. A number of new subdivisions were platted at that time. By the late 1920s the economic and social character of Titusville was well established. It remained the seat of government for Brevard County. County government, with the direct and indirect employment and commerce it stimulated, remained an important component of the local economy. Agriculture, particularly citrus cultivation, packing and processing, was the other important component of the local economy. Titusville was one of the centers of Indian River citrus. In addition to businesses directly involved in citrus, it help support secondary businesses such as the railroads, trucking, banking, hardware stores, and fertilizer companies. Other significant economic activities were cattle ranching, truck farming, and commercial fishing . The Florida Land Boom began to collapse in 1926, bringing to a close a significant period of growth for communities throughout the state. The onset of the Great Depression, following the stock market crash of 1929, further exacerbated the economic problems of these communities. Titusville, like other communities, suffered the effects of the Great Depression. The local economy declined, and for the first time since the 1870s, the population failed to increase at a significant rate. The impact of the Depression was mitigated only by the presence of county government which remained a steady source of employment. Little significant development occurred in Titusville from the late 1920s until after World War II. Shortly after the war, the city began a period of incomparable growth stimulated in large part by the development of the United States space industry complex at Cape Canaveral on the east side of the Indian River. The space industry began in 1950 with the establishment of a missile testing range at Cape Canaveral. The United States government's missile testing program began in New Mexico, but was relocated because of the ever increasing range of missiles and their threat to population centers. After reviewing a number of sites, the government selected the Cape for its launching program. The Cape was advantageous for a number of reasons that included the range length, the availability of land, the undeveloped nature of the surrounding area, and the proximity of support facilities. The main support facility was the U. S. Naval Air Station at what today is Satellite Beach. The facility encompassed some 1,822 acres and was originally known as the Banana River Naval Air Station. It was activated in October, 1940, and served as a base for Naval aircraft that guarded nearby shipping lanes. On August 11, 1949, president Harry S. Truman signed an executive order establishing a testing facility there to be shared by all three branches of the military. The base was eventually transferred to the administration of the air force and renamed Patrick Air Force Base in honor of Major General Mason M. Patrick. When the space program began, the United States government owned the land surrounding the Cape Canaveral lighthouse. It acquired the remaining acreage necessary for the facility from private land owners. In 1958, the National Aeronautics and Space Administration began operations at the Cape. In 1963, the Federal government acquired another large tract of land on Merritt Island, where they developed a major support facility for the launch complex. Although the population of Titusville had grown steadily since the 1920s, its rate increased dramatically following the development of the space industry. It was largely unprepared for the rapid growth. The population tripled from 2,220 in 1940 to 6,410 in 1960. Titusville and the surrounding area also became integrated with the tourist industry for the first time as thousands visited the area to witness the launches. The rapid population growth has created increased demands for essential services and has generated specific concerns about the conservation of the natural and cultural resources of Titusville and other coastal areas of Brevard County. The proposed National Register nominations are intended to ensure the protection of standing structures which embody the significant development of the community. The buildings of Titusville 1867-1930 Multiple Property Group include commercial and residential buildings that are associated with the city's settlement and development between 1867 and 1930. It includes a district containing a concentration of Titusville's historic commercial buildings and individual dwellings located in several residential neighborhoods throughout the community. Residences are the most numerous type of historic buildings located within the corporate limits of Titusville. The most prominent historic residences front on Indian River Drive, which parallels the west bank of the Indian River. They and other historic residences in Titusville embody both vernacular and high styled architecture. Residential architecture in Titusville is largely dominated by the Frame Vernacular, Queen Anne, Bungalow, Spanish Colonial Revival, Mission, and Neo-Classical Revival styles popular in Florida and other areas of the United States during the late nineteenth and early twentieth century. Residential architecture generally emulates models found in other regions of the State and Country. Spanish influenced architecture, prevalent in Florida during the 1920s, combines with the earlier Frame Vernacular and Queen Anne styled residences to exhibit continuity of development, while examples of Craftsman, Bungalow, Colonial Revival and Neo-Classical Revival styled residences add variety to the historic character of residential neighborhoods. Buildings generally range in height from one, to two and one half stories. They are generally set back from the street with modest front and back yards, in some instances as little as ten feet from the sidewalks. Vacant lots are in evidence, the result of demolition or lack of development. Some early buildings have been razed, particularly residences which were in close proximity to the original downtown commercial core and, in many instances, have been replaced by commercial post-World War II period buildings. Nevertheless, the residential buildings included in the multiple property group generally retain their integrity of setting, as well as architectural detailing. The historic commercial buildings within the multiple resource area were constructed between 1890 and 1930. They are generally one and two story, attached and detached, masonry vernacular buildings. The first floors are designed for use as public spaces such as banking rooms, insurance offices, lobbies, and retail storefronts while offices, entertainment, and meeting spaces are located on the upper floors. The historic commercial buildings are located in an area bounded by Broad Street to the north, pine Street to the south, Palm Avenue to the west, and the Indian River to the east. The street facade architecture of these buildings contain typical storefront features such as large display windows and a formal entry, while the upper stories contain the signage and the decorative elements of the building. Decoration is minimal and frequently limited to decorative brick or stonework at the main facade. Shop windows are often flanked by pilasters providing a frame for the displaying of retail merchandise. The main entrance is frequently centered and recessed to avoid competition with the display area. "Kick" panels located at ground level below the display windows are constructed of a variety of materials, most commonly wood. Metal or wood canopies or canvas awnings are used above the storefronts and serve as shelter for shoppers and as an extension of the display surface of the building. The extant historic commercial buildings in Titusville are generally rectangular in plan and constructed of red or buff brick or stucco with flat roofs and parapets. In some instances, the original brick finish has been obscured through painting or the application of stucco. Decorative features include corbelling, dentils, belt courses and name and date panels. The Queen Anne was popular in Titusville from approximately 1870 until 1910. A Queen Anne house is generally two story, distinguished by asymmetrical massing and an elaborate use of shapes and textures intent on producing a highly picturesque effect. Vertical elements are separated by horizontal bands using stone, brick, weatherboard, and shingles. Steep gables, towers, dormers, balconies, and verandas enrich the building. Titusville has several good examples of the Queen Anne, among them 9 Palm Avenue, 505 Indian River Avenue, and 1200 Riverside Drive. Probably the best of these and one of the better examples of the style in Florida is the Pritchard House at 424 South Washington Avenue. The Pritchard House features what has become a trademark of the style, the conical corner tower. Other identifying features of the style are the wrap-around porch, the irregular massing, the variety of exterior materials, and the jig-saw decorative work. The Pritchard House is perhaps the most picturesque building in Titusville. The early residences in Titusville consist of wood frame buildings built for their owner occupants. These buildings are the houses of the first settlers, whose concerns were utilitarian and whose dwellings are best described as Frame Vernacular. Most of the Frame Vernacular buildings in the survey area have a gable roof, although hip roofs are occasionally used. In general, the roof is covered with wood shingles which in many instances have been replaced with composition material. Buildings are one and two stories high and rest on low concrete block or brick piers. Exterior sheathing varies with drop siding, weatherboard, and wood shingles. Fenestration is regular, but not always symmetrical, with wood, double hung sash and doors of panelled wood. Doorways are unadorned. The plan of these houses is generally rectangular, in the hall and parlor, or sidehall plan. "L" or "T"-shaped plans are used to maximize cross-ventilation. The interior finish of these vernacular buildings is usually as utilitarian as the exterior. It is probable that many of the structures classified today as Frame Vernacular were actually Folk Victorian houses that would have been classified as Queen Anne during their historic period. However, due to extensive loss of decorative elements, and their simple plan, they no longer contain enough of their original ornamentation to properly be labeled Queen Anne. The masonry vernacular structures of Titusville are most often two to three stories with flat roofs and parapets or false fronts. The main building material is brick, with examples of concrete block and hollow clay tile also in evidence. Fenestration is most often regular, double hung sash at the upper stories, and storefront display windows at the first story. Decorative detailing is limited to the cornice and dentils. There are several stuccoed structures with parapets that vaguely reflect the Spanish Colonial Revival and Mission styles. The bungalow style is predominant in the historic residential architecture of Titusville. The bungalows generally contain a rectangular ground plan with the short side of the building facing the street. Other identifying features include a gable over gable roof line, exposed rafter tails, decorative beams or braces under gables, tapered chimneys, and battered porch columns. Titusville has several examples of the Colonial Revival style. The exterior of the houses are based mainly on Georgian and Adam precedents but lack the extensive and distinctive articulation of form typical of the higher styled examples. The houses in the survey area are generally two stories in height and have a hipped or pyramidal roof and a large hipped dormer facing the street. The overall boxy appearance of the building may be relieved by a hipped porch or veranda supported by columns. Two of the better examples of Colonial Revival homes in Titusville are 620 and 621 Indian River Avenue. The Colonial Revival styling of these buildings is expressed through such features as massing, fenestration, door and window types and placements, balustrades, entrances, and porches. (see: Colonial Revival) A variant of the Colonial Revival style is the Dutch Colonial Revival style. The characteristic feature of the style is the gambrel roof. The gambrel roof covers the main portion of buildings and extends downward at a sharp angle to cover intersecting porches and dormers. It was devised to provide ample headroom under a pitched roof and, like the mansard roof, created a full additional story out of attic space. The only full example of the style in Titusville is the Judge George Robbins House at 703 Indian River Avenue. There are several examples of the Mission style in Titusville, represented in both residential and commercial buildings. The identifying features of the Mission style are the curvilinear dormer or roof parapet, smooth stucco wall surfaces, arched window and door openings, and tile roof surfaces. In commercial buildings designed in the style, roofs are usually flat while in residential buildings they are often hipped or gabled. Architecture reflecting a Mediterranean or Spanish influence is also prevalent in Titusville. Spanish Colonial Revival styled structures are numerous in residential areas, but rarer in the commercial structures. They are distinguished by low pitched hipped or gable roofs; arches at the entrances, fenestration and porches; stucco exterior walls; clay barrel tile roofing; elaborate doors emphasized by adjacent spiral columns; pilasters; carved stonework, or patterned tiles; caste-iron grill work; balustrades, balconies, and balconettes; clay barrel or s-shaped tile chimney tops; canales; scuppers; round or square towers; and loggias. The Neo-Classical Revival style of architecture is apparent in the commercial structures of Titusville, most notably the Brevard County Courthouse. The style is dominated by a monumental portico on the facade of the structure. In addition, the style makes use of full cornices, regular fenestration, Corinthian or Ionic columns, dentils, modillions, and pedimented gables. Most often, the main block contains a hip or flat roof with parapet. The style is best represented by the Brevard County Courthouse at 506 Palm Avenue and the Bank of Titusville and Trust Company building at 300 Washington Avenue. The Brevard County Courthouse embodies the classical tradition in courthouse design. Its proportions are symmetrical and monumental with a smooth masonry surface. Its facade is taken from the Doric Order. Features associated with the Doric Order include a colossal portico, an enriched frieze featuring triglyphs and metopes, and a pedimented roof with modillions beneath the cornices. The courthouse is the landmark historic building in Titusville, although alterations have changed its appearance a great deal since it was originally constructed. The historic development of Titusville spans the years from 1867, when Colonel Henry Titus settled the town, until approximately 1927 when the collapse of the Florida Land Boom greatly curtailed development. The collapse precipitated the close of a significant period of growth for communities throughout the state. The collapse of the stock market in late 1929 exacerbated the economic problems of Florida communities and confined Titusville's period of significant historic development to the early months of 1930. The Associated Property Types: Buildings of Titusville 1867-1930 embody the significant development of the town its initial settlement by Henry Titus 1867 through the end of the Florida Land Boom in 1930. They are associated with individuals, themes, and events which shaped the history of Titusville and reflect its significant architecture. The structures are of local significance and retain their architectural integrity to a large degree. Historic areas of Titusville embody the physical development of the city during the aforementioned period. Two distinct areas can be defined: commercial and residential. Because of the relatively small size of the community in comparison to today's standards, these areas are in close proximity to each other. The commercial area consists mainly of the downtown commercial sector where masonry vernacular buildings predominate. Few structures that predate the 1895 fire have survived without substantial alteration. To the south and north of this central commercial core are historic residential areas containing numerous historic residences. Areas to the east of the commercial sector reflect mixed use associated with the arrival of the railroad in the 1880s and contain boarding houses, large houses and commercial structures. The majority of commercial buildings in Titusville are masonry vernacular with elements of Neo-Classical Revival, Mission and Spanish Colonial Revival styled influencing. However, Titusville does contain several historic structures that distinctly embody the Neo-Classical Revival style, reflecting the dedication of early Titusville residents to build a "cosmopolitan" county seat. 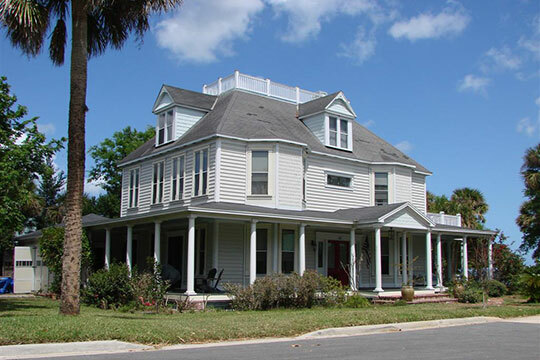 Residential architecture in Titusville is largely dominated by Colonial Revival, Queen Anne, Frame Vernacular, Bungalow and Spanish-influenced styles. The extant residential buildings date from the 1860s through the 1920s. The variety of styles in the houses reflect the influence of northern markets on the mall town as well as the distinction of being the county seat. Titusville contains a large number of residences in a confined area that give the town a distinctive setting and sense of place. Welcher, Vicki, Florida Bureau of Historic Preservation, Titusville Multiple Property Group, nomination document, 1989, National Park Service, National Register of Historic Places, Washington, D.C.